Savoy Steam by Penhaligon's is a new introduction to the line, debuting in 2017 in both eau de parfum and eau de cologne strengths. The perfumer is Juliette Karagueuzoglou. Penhaligon's is the epitome of British scent, at least in the historical sense. With this in mind it makes sense that they paired with one of London's most venerable hotels, The Savoy. The Savoy was opened in 1889 to immediate acclaim. It was the first London hotel to have electric lighting and an elevator ascending to the upper floors. Most impressive to its guests was the addition of private en suite bathrooms and tubs that filled with a cascading flow of always hot water. Hammam Bouquet debuted in 1872 and was Penhaligon's first scent. It referenced the Turkish style of baths and the hammam experience. Savoy Steam has a more British modern take on the bath, conjuring deep claw-footed porcelain tubs with gleaming chrome faucets, sitting atop marble floors worn glass smooth by decades of wear. This is an aromatic perfume and Penhaligon's website describes it as "a steam mist of roses" featuring head notes of rosemary oil and pink pepper, heart notes of steamed rose and geranium, and base notes of benzoin and incense. This perfume is very light and airy on my skin, further emphasizing the "steam" concept. I don't know how perfumers make this happen but it actually does initially smell like steam! I smell the rosemary in the opening and it is joined to a lesser degree by eucalyptus notes. The pink pepper note is mild. The rose steam presents itself fairly quickly but the rose scent is very pale and watered down. I smell the floral note but if I didn't already know it was rose it would have taken me some time to identify it as such. The rose softens the herbal notes. You get that impression of a steam iron on crisp fabric or of walking into a faintly aromatic steam bath. Occasionally I get a whiff of steamed rice but it's fleeting. I find this to be a very neutral perfume. It's not exactly herbal; it's not really rose. It smells clean and bracing. I would enjoy wearing this in the heat of summer or anytime I needed a pleasant pick-me-up but didn't want to broadcast scent. For such a quiet scent it is very tenacious. It lasts several hours but I felt like it emitted scent no more than about six inches from my skin. The bottle is appealing. I like the readily identifiable Penhaligon's shape although I heard a rumor they may be changing the packaging. I hope not. 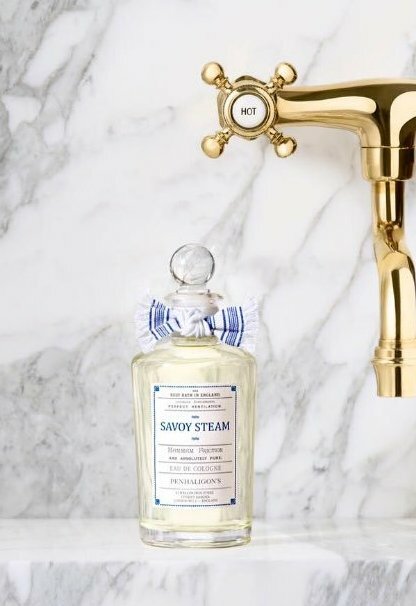 Although this perfume venerates the Savoy luxury experience, the tie made out of blue and white fabric resembling a Turkish fouta gives a sly nod to the brand's hammam-scented heritage fragrance. This perfume is fairly simple but I quite liked it. I didn't know when I sampled Savoy Steam that there was a cologne version so I am not able to make a comparison. However, as light as the perfume wears on me, I doubt I would find the cologne to have adequate sillage for the price point. Sometimes it's nice to have a perfume that doesn't project too much, doesn't lean floral or citrus or spicy, that just gives a happy mist of fragrant feng shui to the day. Savoy Steam could be this perfume for me and it has gone on my (very long) buy list. Top photo from www.Penhaligons.com. Sample from Penhaligon's boutique, Singapore. Thanks Undina. Sometimes I enjoy simple. I'm enjoying your trip review posts~!